This painted metal menorah, the brainchild of one of the masters of Israeli art, Yair Emanuel, features a colorful depiction of Jerusalem. 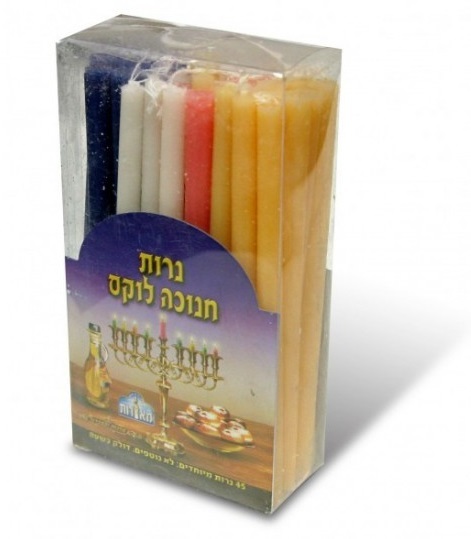 A remarkable work of Israeli Judaica, this is a beautiful setting for your Hanukkah candles. It is customary to light one candle on the first night of Hanukkah, and increase the number of candles by one each night, so that on the eight night – each menorah boasts eight shining lights representing the eight nights, and an extra candle, the “shamash”, which is used to light the other candles and is then displayed. World-renown Israeli artist Yair Emanuel, famous for his remarkable creations of Israeli Judaica and Israeli art, has crafted a metal, spectacularly hand-painted menorah that completes any Hanukkah family photo. Emanuel has used the best laser metal-cutting techniques modern technology can offer to craft menorahs into different unique shapes, and then hand painted each one to perfection. This Chanukia is a modern look at the city of Jerusalem – A rectangular base houses the candles, with intricate swirly designs painted on the top and sides of the base. Images from the holy city of Jerusalem rise behind the candles, bringing the City of God to life in a way never seen before. The ancient vistas of Jerusalem, houses trees and stairwells are displayed in a spectacular blaze of color. Measures 20 X 2.1 X 7.8 inch. Emanuel’s latest masterpieces are perfect gifts for the occasion of a Bar or Bat Mitzvah, or as a housewarming gift, graduation gift, engagement gift or of course, as a Hanukkah gift – perfect for any lover of beautiful Judaica or Israeli art, or just for someone who would like a gorgeous menorah.